I live in a middle class area near Glasgow and have family and friends in Edinburgh. In my experience it is easier for unionists to have a voice and speak their minds. Unionists feel they can say what they like, openly and freely, without fear of any repercussions. By contrast, I have supported an independent Scotland all my life, but I often feel I have to keep quiet or am looked on as an oddity. The middle classes are supposed to support the hierarchy establishment, in order of protect their own wealth. It matters not it seems, that Scotland has one of the most unequal land ownership, embarrassing levels of poverty and that tenant farmers have no rights. The tiny rich elite must be protected at all costs and this elite are determinedly against change of any kind. Who owns Scotland and why are they being subsidized? I don’t want Scotland to be part of a centralized trickle-down economics from a London super state and under American vested interests. The Tories also want to enforce market-driven health care here. Many Indy supporters are threatened. How is this democratic? One told me recently with regard to Scottish indy, that she didn’t want to get smaller. I have heard this concern before and it strikes me as a completely different way of viewing Scotland’s indy. I want Scotland to get bigger on the world stage and to be able to protect our national interests and resources - why not? Presently Scotland is side-lined, ignored and diminished as part of disunited UK and our resources are being squandered. We are led by arrogant, ignorant and lazy politicians at Westminster. I don’t want an indy Scotland building walls with its neighbours or with Europe. Indy is not about borders for me. We must speak with both national and international voices. Change can only happen in small places. Scottish indy is both inclusive and outward looking. At a talk at Edinburgh book festival, Gina Miller spoke of moving pivisions – and I agree – but moving past wealth divisions will not be so easy. The system needs changed through independence. How are we best governed? What is best practice? Why is making decisions locally ‘being smaller’? In todays internet world we can live on remote islands and still remain connected to the outside world. Europe has moved on and rejected feudalism. America has not moved on, even while it has a Bill of Rights and a written constitution (unlike UK) – it continues to have protected elites and vested interests. I lived for ten years in America and it does have a federal system of government where each state controls its VAT and state taxes. But it also has great divides and inequalities. False tribalism and division must end for the sake of our country. But there are differences here. I believe difference and informed different views are essential to reach a realistic consensus. But artificial tribes, around old, ignorant hatreds have no place in a progressive democracy. It is a fallacy that ’Brexit’ is about any kind of independence – its really about leaving the world’s most successful trading block. This is not only about land – its about power and privilege – and this inequality affects all areas of Scottish life, the urban lowlands also. It’s a culture of divisiveness, rather than a culture of co-operation and equal life chances. We can’t all be the same, but we can have equal opportunities. Self-determination for Scotland, means making our own decisions in Scotland’s best interests and also being good neighbours and in a larger trading block. Self-determination means being connected with the democracies of Europe – rather than in the pocket of American wealthy elites. Scotland has centuries of cultural and trading links with Europe. I believe the size of Scotland is ideal in todays world, to be adaptable and progressive for the future. We can have a media that represents Scotland; we can protect our resources, protect our heritage and invest in local infrastructure. Scottish Indy is a fight to protect our civil rights and our stories and culture. Maybe if Scotland does this, other parts of England will follow. Recently I saw a map of who owns Scotland, and I was shocked by the tiny white sections of publicly owned land. 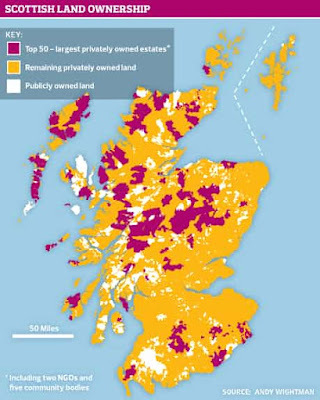 Scotland has the most unequal land ownership in the world. This land was stolen from the church after the Reformation in 1560. Perhaps its time to give it back. Instead of a culture of false greed, we can have a culture of co-operation? I hope this isn’t all about money and that we can all have an equal voice. We have a choice now. We must act, and act soon to change all that.